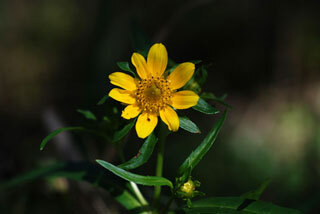 Also Called: Nodding bur-marigold, stick-tight. Stems: Erect or loosely ascending, branched, mostly glabrous; often rooting at lower nodes. Leaves: Opposite or occasionally lowermost in whorls of 3, simple, sessile, linear-lanceolate to oblanceolate, 1.6 to 8+ inches long.4 to 1.8 inch wide; margins finely to coarsely toothed or sometimes nearly entire; surfaces glabrous; tip usually tapering to long point; base wedge-shaped to rounded, usually united around stem. Inflorescences: Heads, solitary or several in loose, open clusters, 1 to 2.4 inches across, erect or nodding; stalks .4 to 4 inches long; disk .5 to .8 inch across; outer involucral bracts 5-10, narrowly lanceolate or linear-elliptic, .25 to 1.8 inches long, unequal, leaf-like, spreading or bent downward; margins entire; inner bracts 6-9, lanceolate to narrowly ovate, 1/6 to 1/2 inch long. Flowers: Ray florets 6-9, (rarely absent), conspicuous, 1/3 to 2/3 inch long, yellow; disk florets 40-150, 1/8 to 1/6 inch long, orangish-yellow. Fruits: Achene, narrowly wedge-shaped, 1/5 to 1/3 inch long, flattened, purplish-brown to purplish-black, 4-angled, with rounded projections and downward pointed barbs, tipped with 2-4 barbed awns, 1/8 to 1/6 inch long, enclosing small seed. Habitat: Low, wet sites, stream and river banks, pond and lake margins, ditches, seeps, marshes; wet soil. Comments: Nodding beggar-ticks is weedy.